Metro Rail foundations have been laid on 58 km, pillars on 56 km and viaduct on 46 km. The total project stretches 72 km. Hyderabad: A total of 1,200 properties are still at different stages of acquisition for the Hyderabad Metro Rail. About 850 properties in Sultan Bazaar and 45 each in the three other corridors at Ameerpet, Jubilee Hills and Secunderabad. A senior officer said that the claims for final settlements were not being cleared. “After notice is served on the owners, compensation must be given to them but that is taking time,” he said. In Secunderabad, the Padma Hamsa Apartments case is before the Hyderabad collector after the court cleared its acquisition. The collector has to decide how much money each apartment owner has to be paid. A total of 1,131.89 square yards of the apartments will be taken over, an officer said. “Hyderabad Metro Rail will pay Rs 7.97 crore but this money has to be divided between each owner. This has to be decided by the collector. Till the collector sits with all of them and decides, the building cannot be taken over,” he said. 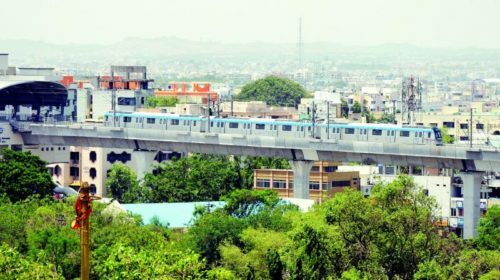 L&T Hyderabad Metro Rail has been asked to clear major traffic areas at Begumpet, Greenlands junction and Ameerpet stadium quickly to free up the roads for commuters. At the Begumpet Rasoopura stretch, traffic is completely stopped at night to allow construction. Despite this, a senior state government officer said, work was not happening at the required speed. Chief secretary Rajiv Sharma had pointed out that the works had to be completed quickly so that commuters are not troubled. A senior traffic police officer explained, “We deploy traffic personnel on the Begumpet stretch for long hours, yet it is difficult to manage as the road space has been reduced to a large extent. Open areas below the Metro Rail viaducts and stations are being occupied by miscreants, beggars and footpath dwellers. Many of them had been using the space near the Begumpet railway station, which is now occupied by construction activity. Complaints regarding this have been sent to the traffic police office at Rasoolpura. Mr P. Satish of the Begumpet traffic police said cops were evicting the illegal occupants but they were returning due to the continuous rains. “While some of them sleep at night and are not seen during the day, beggars and drug addicts are seen in the afternoon,” he said. Metro Rail staff working at night have been shooing them away. A senior official said that once construction work is complete, Metro Rail would beautify the stretch and barricade it.